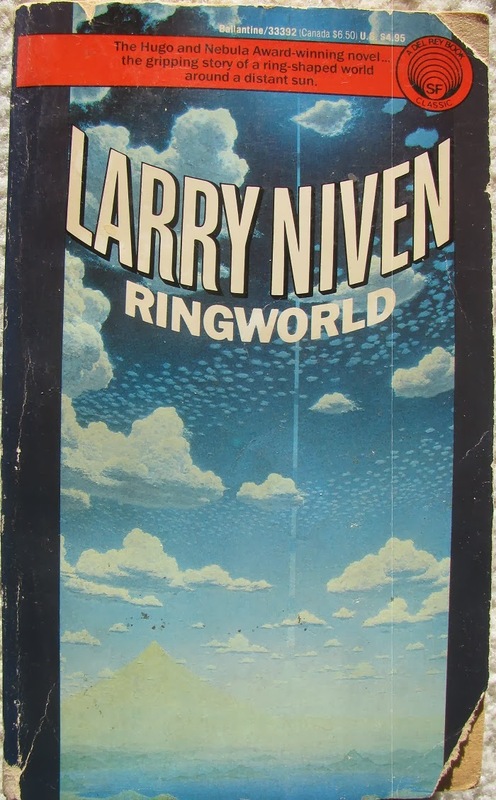 Larry Niven wrote Ringworld at a time (1970) when it was considered acceptable and even trendy for artists to disrespect their audience. Having lived through that era and having been battered by dissatisfying endings, by authors and movie directors playing mind games or treating me as if I was a toy for them to manipulate, I am ever-so-glad that fad disappeared quickly. Ringworld isn't so bad as some. It has a nicely satisfying ending and it presented a rich well-imagined world. But the author's style suffered from a the 1970's-haute tendency to treat the reader as an outsider. Perhaps it was just me. Maybe hard-core fans of hard-core science fiction at the time had heard of all the myriad of imagined technologies that were mentioned--named--with the assumption that they needed no explanation, as if the reader was supposed to know as much about them as the characters living in that world. The story is imaginative in the extreme. It throws together four characters - two humans and two aliens with cultural and physical differences designed to keep tension high - and sends them on a quest across the galaxy to a newly discovered artificial world built in the form of a ring that spins about its sun such that centrifugal force creates gravity and keeps its inhabitants pinned to the inner surface along with an atmosphere, oceans, soil, etc. 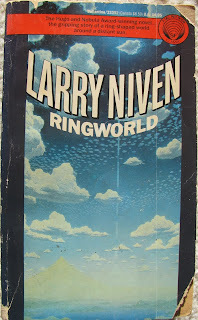 Niven envisioned the ring as being 600 million miles in length (circumference) and a million miles wide. He barely bothers to explain how it might be built and maintained. Since it is always high noon at every point on the habitable inner surface of the ring he decides to suspend (using invisible wire of virtually infinite tensile strength) a series of sunlight-blocking 'shadow squares' between the sun and the ring in order to artificially create a day/night cycle. This is a peculiarly unnecessary complication (except for the fact that Niven's characters would eventually need some of that wire). People could shut their blinds. People live happily in Svalbard with no darkness for 4 months at a time. The pace of the action is steady and gripping enough to have kept my interest. I enjoyed reading the book, but I did not enjoy the main character, 200 year old Louis Wu. The author uses him as an omniscient explainer of things that he could not possibly have figured out - including history and technology he had never seen, and even the behavior of the other characters. It was simply not believable even in this highly speculative sci-fi setting. So lets talk about the setting - the technology. It bordered on pure fantasy and supernatural. Niven concocted a major catastrophe at the center of the galaxy which would destroy all life within a few tens of thousands of years. But he had a solution for it. And in fact he had a solution for virtually every physical limitation our real non-catastrophic universe presents us. He has immortality drugs, multiple kinds of stasis/suspended animation, psychic weapons, several technologies to travel and communicate faster than the speed of light, virtually indestructible materials suited to every imaginable need. And he didn't stop there. He assumes that genetic selection for god-like invulnerability (what he calls 'luck') could take place in six generations of breeding. He assumes microbes could evolve to feed on certain specific, plot-convenient, technology-critical materials but on few other easier-to-digest things -- e.g. he exposes his four heroes to all these evolved microbes and they don't get so much as a sniffle. It was all just a little much to take - I felt such a heavy burden of disbelief that in order to suspend it, I, too, needed some of his invisible 'shadow square wire'.